Maria Montessori was the first woman to practice medicine in Italy. A scholar of biology, psychiatry, anthropology and medicine she graduated from the Faculty of medicine at the University of Rome in 1896. 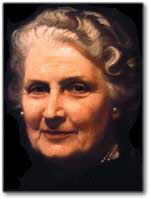 As a physician, Dr. Montessori was in touch with young children and became profoundly interested in their development. Through careful and exhaustive scrutiny, she realised that children construct their own personalities as they interact with their environment. She also observed the manner in which they learned as they spontaneously chose and worked with the didactic materials she provided. She studied children of all races and cultures in many countries around the world, soon seeing the universality of the laws of human development. She continued her observations throughout her life, widening and deepening her understanding until her death in 1952. Also a devoted humanitarian, she was three times nominated for the Nobel Prize for her advocacy efforts towards a more peaceful humanity. the child as a unique, unrepeatable, respectable and admirable individual to be unconditionally accepted as one of life’s most marvelous expressions. The Montessori method has since spread to every country throughout the world. The method reached Australia in the early part of the last century and today is recognised as one of the most progressive educational methodologies of the modern world. The first Montessori classroom was established in Blackfriars School in Sydney in 1912. There are currently 210 schools and centres Australia wide with the appeal of this method growing steadily among all communities.